Cultural materials present conservators with a range of challenges. Issues of degradation, material instability, the choice of best treatment method, or maybe no treatment at all; all these issues are part of the thought and decision-making process that goes into working with cultural material. Some materials present a danger to the health and well-being, which brings up a whole host of challenges. Taxidermy is one of those risky items! Taxidermy is the process of preserving an animal skin so it can be mounted and modeled to appear life-like. The practice is thought to have emerged as a practice around the 16th century, but it wasn’t until the 18th century, as scientific exploration and an interest natural history became more widespread, that handbooks detailing the practice and techniques began to appear (Péquignot 2006, pp. 245-246). The main problem faced by these early taxidermists was how to preserve the skins to protect them from deterioration and insect attack. The solution came in the form of preservatives which could be applied to the skin as a bath, soap, powder, or paste. The most common and effective of these was arsenic, or arsenical soap (Péquignot 2006, pp. 246-247; Marte et al 2006, pp. 143-144). Along with arsenic, mercury (mercuric chloride) was also used as a pesticide in taxidermy and decorative fur items (Stavroudis 2003, p. 8). Understanding these hazards when working with natural history items is crucial to the health and safely of the conservator. In developing a treatment plan for my taxidermy item, an infant reptile with an unknown manufacture date, prior research into preservation methods made the first decision clear: the object needed to be tested for dangerous heavy metals or pesticides. The elemental composition of an object can be analysed via x-ray fluorescence spectroscopy (XRF). During analysis the energy of the x-ray beam is absorbed by an atom, and this forces inner shell electrons to be ejected. An outer shell electron will then enter the inner shell to occupy this vacancy, and this produces a photon. The energy difference between the electron in its outer shell and its new inner shell is the energy of the photon that get emitted. The frequency of the resulting x-ray is unique to a specific element (Stuart, B 2007, p. 234). The spectra produced shows characteristic peaks of energy which are identifiable as different elements. 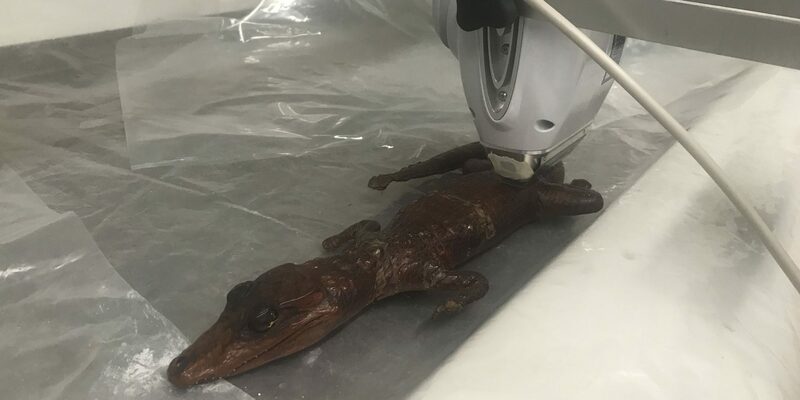 A portable XRF machine was used to analyse the taxidermy infant reptile in-situ. Correct OH&S procedures were followed, and the testing took place inside a fume hood covered in plastic. The test results indicated that the object did not contain any hazardous materials, so the object could be treated without more intensive OH&S measures being put in place. 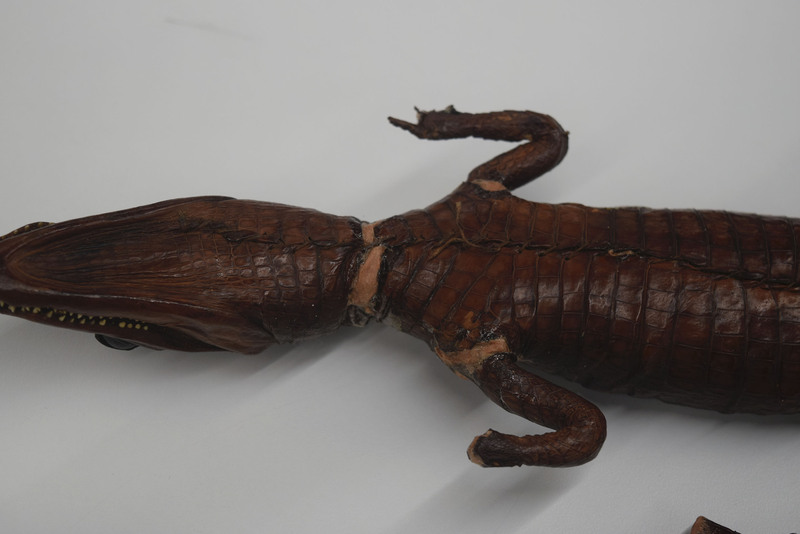 Natural History objects are fascinating to work with and are an important part of our cultural collections, but there are certain risks associated with these objects so care, planning and correct OH&S procedures need to be considered before any treatment begins. 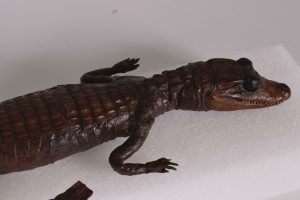 The taxidermy infant reptile specimen has large tears across its body which are made more noticeable by the adhesive around these tears. Three of the five tears (on the back and both arms) are filled with adhesive, and the other two tears (on the underside of neck and proper left leg) are open but show signs of having been coated in adhesive at some point. 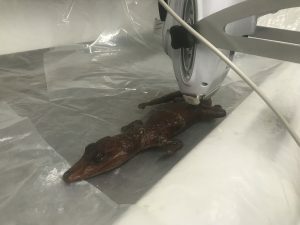 The aim of the proposed treatment was to gain experience working with a taxidermy object and to return the appearance of zoological accuracy to the object. To achieve this goal, it was decided that the adhesive should be removed. The process began with an attempt at mechanical removal using a scalpel and under a microscope. It became apparent that while the adhesive appeared brittle, much of it was still firmly attached to the surface layer of the skin. Further attempts at removal posed a serious risk of extensive damage to the surface and the possibility of loss of original material. Due to this risk, the decision was made to stop the mechanical removal and instead attempt to solubilise the adhesive. Different materials and surfaces react to liquid in different ways. It is important to test solubility in a discrete area of the object and closely watch for any negative effects. As the taxidermy object is made of organic material, which is sensitive to water, the risk of damage is much higher, so care needs to be taken. Instead of testing the solubility, which would have been proper practice, the correct methods for proceeding with adhesive removal were overshadowed by personal frustration. This led to an untested treatment material being used. A gel solution was trialled on the taxidermy object. Initially, the gel treatment was very successful in removing the adhesive, but it was clear when looking under the microscope that the gel was solubilising the surface coating under and around the adhesive, which was peeling away. The peeling and partly solubilised coating in this area had to be removed with a scalpel or hard brushing, which in turn was damaging the now damp and sensitive surface. The treatment was stopped straight away. A well thought-out plan for why and how a treatment is carried out, along with thorough testing and materials research, is a crucial part of making sure the codes and ethics which inform correct professional practice are being adhered to. Without these measures, ill-informed treatments can be carried out, which places the object at risk. This mistake was made on an object which had been purchased for training and gaining experience and this was one of the most crucial lessons that was learnt from it. The importance of critical thinking and methodical decision making has been emphasised throughout this course and the importance of practicing and maintaining this process as an emerging conservator was made especially clear during this project. Japanese tissue paper is a versatile repair material which has long been a staple of paper conservation. More recently, it is being used in natural history conservation and with great success. Japanese tissue has been used to repair losses in bones, bird’s legs, and egg shells. It can also be molded, has been used to replace missing furry ears, and can replicate the texture and appearance of various animal skins (Umpleby 2010; Larkin 2016). While treating a taxidermy infant reptile, it was decided to use Japanese tissue to infill the tears in the scales. Most of the tears were filled with or hardened by adhesive so they were not able to be re-joined. The adhesive could not be removed without potentially risking the strength and stability of the object, so infilling seemed the best option for treating the tears. Japanese tissue, which was chosen with the help of an experienced paper conservator, was toned for a closer match to the object. The finished toned paper was too light for the object, but this was not an issue for this project as this would allow for the chance to attempt in-painting to further the learning experience provided by this treatment. It would be possible to darken the tone of the paper so inpainting is not required. The Japanese tissue was saturated with 5% Paraloid B72 in acetone. The tissue was the applied to the tear with tweezers and worked into place with a thin paint brush and a modelling tool. The tissue at first was tricky to work with, the fibers didn’t quite match the smooth scales and the adhesive became quite stringy as the long fibers stuck together. A method was quickly established where the fibers were pressed back towards the inside of the tear and pushed against the edges of the tear, rather than have them branch out over the scales. The fiber clumps were easily smoothed out with some acetone and then could be worked into a surface that better matched the surrounding scales. Figure 3: The completed infills on the neck and arm tears. The neck tear was previously open, so the tissue repair was used as a bridge between each end of torn skin. The arm tears are full of dried adhesive, so the Japanese tissue was placed on the top to fill the slight indent. Once the infills were dried they, were inpainted with acrylic paint. Japanese tissue was also used to model new claws onto the front feet of the taxidermy reptile. Small sections of the paper were torn off and modeled into claws using a modelling tool and dental tool. It was delicate work and the tissue paper was difficult to wrap into the three-dimensional shape of the claws. 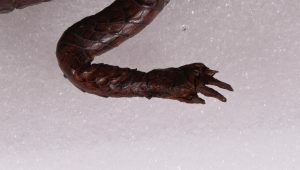 Close-up the claws are not perfectly life-like but, when observed with the object as a whole, they do add to the zoological accuracy of the specimen. Dickinson, J. 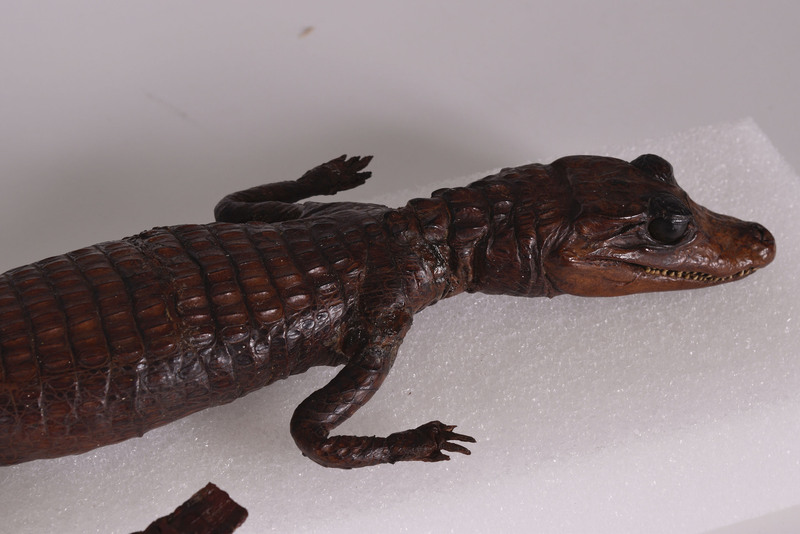 A 2006, ‘Taxidermy’, in Conservation of Leather and Related Materials, M. Kite & R. Thomson, Elsevier, Oxford, pp. 130 – 138. Larkin, N, R 2016, ‘Japanese tissue paper and its uses in osteological conservation’, Journal of Natural Science Collections, vol. 3, pp. 62‐67. Péquignot, A 2006, ‘The History of Taxidermy Cluse for Preservation’, Collections: A Journal for Museum and Archives Professionals, vol. 2, no. 3, pp. 245–255. Stavroudis, C 2003, ‘Health & Safety: Mercury, The Other Heavy Metal’, WAAC Newsletter, vol. 25, no. 1, pp. 8 – 11. Stuart, BH 2007, Analytical Techniques in Materials Conservation, John Wiley & Sons, Incorporated, Hoboken, viewed on 18 April 2018, available from: ProQuest Ebook Central. 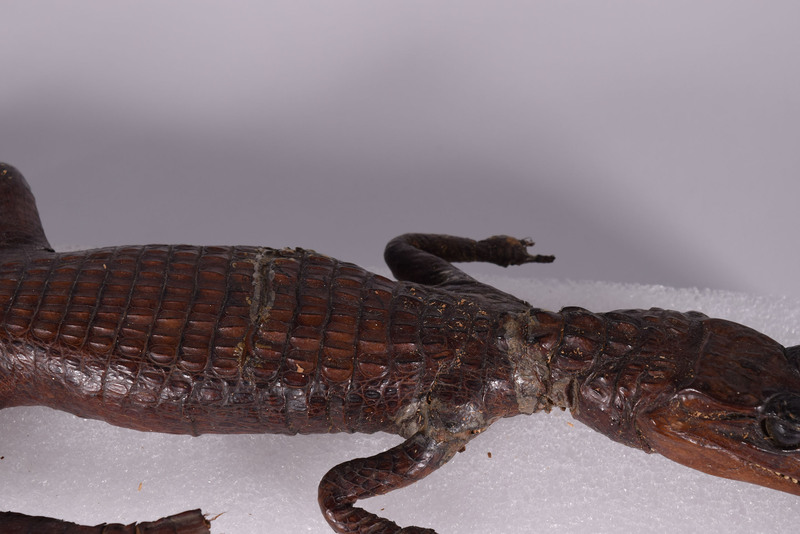 Umpleby, S 2010, ‘Replicating Skin Textures and Fur Using Japanese Tissue Paper’, ICON News, Issue 26, The Institute of Conservation, pp. 32-34.